It’s the Size of the Fight in the Dog That Matters, Remember? It’s time for a change of subject. 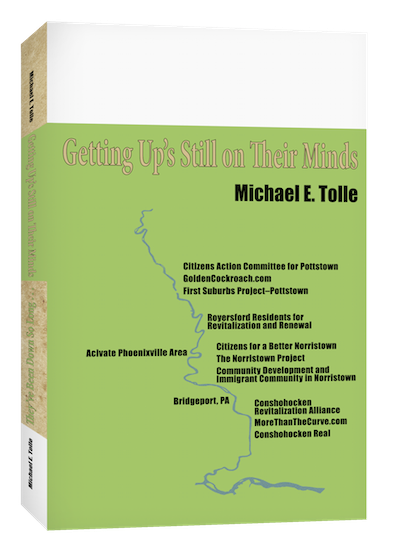 I write about national issues, using the eight towns on Pa.’s lower Schuylkill River as my specific subjects. My general issue of late has been diversity, with the focus on immigrants to the Schuylkill Valley, then and now. That has meant that I focus on the largest and most diverse among my subject towns. But this month I am going to take a look at a town that is not only the smallest, but also the least diverse of the eight, West Conshohocken. West Conshohocken deserves more appreciation than it gets. Every one of the eight towns has suffered the slings and arrows of outrageous fortune, particularly after a brief post-WW II prosperity, but West Conshohocken has suffered well out of proportion to its relative size. Circumstances of birth and location have always worked against it, but its residents still managed to create a vibrant, if miniscule, community, built around the traditional anchors, its ethnic churches and volunteer fire company. The debacle that spanned the sixties, seventies and the early eighties left little of what used to be, but the community survived. Then, in yet another blow, this one quite literally to the body, it was West Conshohocken’s fate to host the instrument of regional renewal, the interchange(s) of Interstates 76 and 476. The result, if measured solely in property values, has been spectacular. I, as an outsider, can see that quite readily. But I, as a professional attempting to add historical understanding to the toolbox of those seeking community revival upriver, have to also ask about the cost to the community. It think it’s an important question, with relevance to those upriver also. It’s also a question that can only be answered by the community’s residents. Numbers have always worked against West Conshohocken, because it has always possessed the smaller—or later—ones compared to anyone else. It was the last borough birthed on the lower Schuylkill, in 1874. It was a healthy baby at first, with the second largest initial population of the eight towns. It was doomed, however to be the runt of the litter, due to circumstances of timing and location. The timing problem was its late delivery, and its location problem was that it was just across the Schuylkill River from Conshohocken. The 1880 Census listed the brand-new borough of West Conshohocken as housing 1,462 residents. By that date, however, Conshohocken had already been a borough for twenty-four years, and possessed a population of 4,561. West Conshohocken illustrates perhaps the best of any lower Schuylkill River town how first survival and then growth depended on how it managed a dichotomy that required combining two extremes: distance and closeness. Distance, or rather the difficulty of achieving it, founded both Conshohockens, as it did every other river town, in this case via Matson’s Ford. The Schuylkill at that time as a considerable barrier, and points at which it could be crossed in relative safety became well known. Each of the Schuylkill River towns began as one half of a river crossing. Those enterprising enough to locate themselves at such crossings were the first businesses, and employers. Travel over distances thus brought each river crossing into being, and sustained its early growth. As a result, the commercial offerings of every such emerging town were for a considerable time focused more on those who passed through than those who lived there. That began to change when a new way to conquer distance entered the Schuylkill Valley: the railroad. In not too long a time, traffic along the river, using its floodplain, began to exceed that crossing the river at those special points. This easier, quicker and cheaper access to distances brought industry to the river towns, and then the immigrants to work in the mills and factories. This is where closeness enters the picture. Connections to distance built the towns, but the need for closeness determined how they were built. The physical appearance of West Conshohocken, as well as its sisters along the lower Schuylkill, is due to the fact that the overwhelming percentage of its occupants had to walk from home to work and back again during the week. They then had to repeat the process to and from another location on Sunday, plus similar small journeys to obtain life’s necessities in the era before refrigeration. Work, housing, worship, shopping, everything was built in close proximity to everything else, because it had to be. West Conshohocken followed the pattern, in smaller numbers and amidst some of the more challenging terrain of any river town, and packed in what it could as closely as it could. Each river town managed this balance of extremes during the eras of the horse and wagon and the railroad, but were mortally challenged by the automobile and the truck. The death of the railroads severed the close connections of each town to the wider world, while the automobile and the truck required a great deal more space within each borough to accommodate them than had the railroad. There was too little room for the expansion of streets—and the creation of parking lots—that the automobile required, and the result devastated the borough shopping areas. If West Conshohocken lost less in raw numbers than any other river town during this period, that was because it had the least to lose. The automobile revolution would fundamentally change every town, and for the worse, but none would suffer worse than West Conshohocken, whose curious fate it was to suffer along with the others during a long period of decline, then physically host the instrument of regional revival, that quintessential symbol of late 20th Century America, the Interstate Highway Interchange. For West Conshohocken, that meant, on balance, more suffering. The blows came in two stages. First, an exit off the brand-new Schuylkill Expressway was planted on its soil. 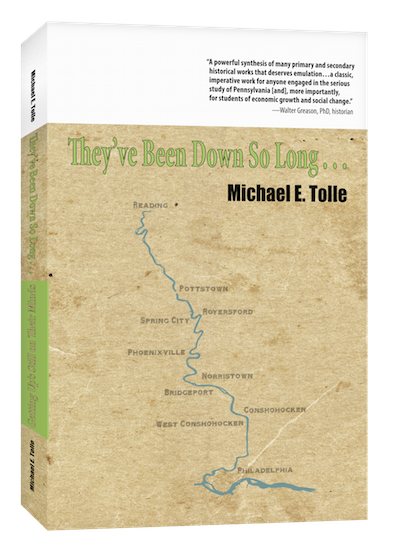 Adding insult to injury, it even became known as “the Conshohocken exit.” But the big one was the second, which arrived with the construction of what began as the “Blue Route,” first appeared as the “Mid-County Expressway,” and was completed as Interstate Route #476. As the opening and closing sentences point out, West Conshohocken never possessed several of the usual standard features of urban life before the Second World War, but managed establish a true community nonetheless. 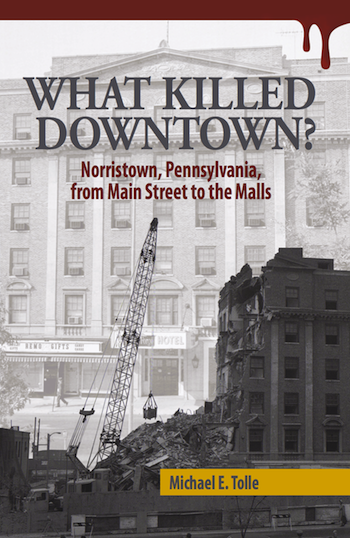 But make no mistake about it; the new superhighways did indeed devastate West Conshohocken. The physical devastation is the most obvious. In all, as much as 25% of West Conshohocken residences may have been sacrificed to the superhighways, according to my friend Jack Coll, Conshohocken historian par excellence. West Conshohocken paid an additional penalty, as the land lost to straightened roads and widened streets quickly filled with automobiles and trucks. These vehicles represent the prosperity that the Interchange has brought to the region, but expediting their movement through town, at the expense of anyone who might think of walking anywhere, has become the necessary policy. These roads—and the flood of vehicles on them—have sundered West Conshohocken into what to this only periodic visitor seems like isolated sections. Walking within the Borough of West Conshohocken requires following an indirect route, crossing the roads only at a few specified points, in the brief period in which pedestrians are allowed, and even then often weaving between cars blocking the walkway. So here we have a town, always small, but which today houses fewer people than it did when it first appeared, almost 150 years ago. Some of the picturesque old buildings remain, but the Borough has no old downtown, because it never had one at all. The Interstates have brought prosperity to both Conshohockens, but the smaller borough has paid by far the greater price. The cumulative effect has been to render what had once been a small but vibrant (and all the more closer-knit due to its size) community into a regional traffic bottleneck cut into sections by wide roads, a place where few live but through which a great many pass on a daily basis. These things are easily visible to outsiders like myself. But the answer to the effect of all this prosperity on the community of West Conshohocken can only be determined by hearing the views of those people who actually comprise that community, those who live there. I follow the Facebook pages devoted to West Conshohocken, and am quite willing to believe that there is a lot of fight left in this little dog. That’s why I conclude this post with an appeal to the residents of West Conshohocken to read this post and send me comments on the current state of their community. I’ll follow up this post next month with one on the results of my request. I also post a link in broadly urban-oriented Facebook pages, and believe that the experience of this tiny community in the face of such tectonic forces will find an audience. I look forward to hearing your thoughts.